Set sail from Bergen on your 22-night Ultimate Arctic and Fjords Cruise with Scenic Eclipse. 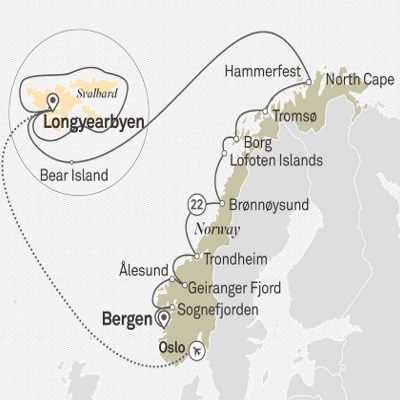 Your journey into wonder begins today with a flight from Bergen to Longyearbyen. Relax and raise your glass to the days ahead at this evening’s welcome reception. Zodiac excursions; opportunity to take submarine excursions. Daily lectures by Discovery Team. Cruise through the high Arctic in search of Bearded seals. Daily lectures by Discovery Team. Cruise through the high Arctic. Explore one of the many glaciers that envelope this great icy wonderland. Zodiac excursions; opportunity to take submarine excursions. Zodiac excursions; meet Hammerfests resident reindeer. Zodiac excursions; opportunity to take helicopter and submarine excursions. Discover the hidden wonders scattered across this landscape via helicopter and submarine. 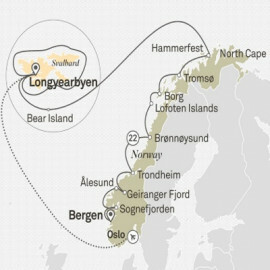 See the beauty of Lofoten Islands wildlife by air. Relax onboard with a spa massage or poolside cocktail.